I will be doing a workshop at the Montreal Anarchist Bookfair next weekend, on the topic “Anti-State Politics on the Far Right.” The book fair takes place in Montreal on May 26-27 and is free and open to the public. My workshop will be on Saturday the 26th at 11:00 am. 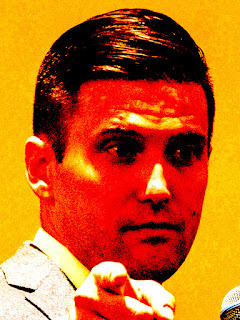 In recent decades, some far rightists have combined anarchist language and symbols with white supremacist or other anti-egalitarian philosophies, under labels such as National-Anarchism, anarcho-pluralism, and Autonomous Nationalism. Focusing on developments in the United States and Europe, this workshop will explore these groups’ ideologies, political roots, attempts to recruit or ally with left-wing anarchists, and relationship with broader trends within the far right. Opposing centralized political power doesn’t necessarily mean opposing social hierarchy and oppression. Far right anti-statism has varied ideological roots, including Third Position fascism, the European New Right, and libertarianism. Far right anti-statism partly reflects a general tendency by far rightists to use distorted versions of leftist politics – such as anti-imperialism, environmentalism, anti-capitalism, or feminism – to present themselves as a radical alternative to the status quo. Far right use of anarchist themes also reflects a broader trend toward political decentralism among many different far right currents. While fascists traditionally celebrated big, centralized states and top-down organization, many far rightists now advocate leaderless resistance, political secession, small-scale theocracy, or federations of “tribal” communities. Some anti-statist far rightists have tried to ally with, recruit from, or infiltrate left-wing anarchist circles around shared opposition to the existing state. It’s important to expose and reject these overtures.